How to care for delicate items and do not damage porcelain when cleaning? Learn how to restore the original appearance of porcelain products at home. When cleaning such brittle materials as porcelain, you must use cool or warm water. Too hot water can damage the surface of these delicate items. When washing porcelain, avoid water temperature changes. Be especially careful when cleaning porcelain dishes with metal trim. Avoid bleaching agents and abrasive cleaners. If you doubt how to clean your porcelain, it is always better to seek professional help. Porcelain is one of the types of baked clay. He was invented in China and is now used to create a variety of items, from decorative tea sets to bath fixtures. 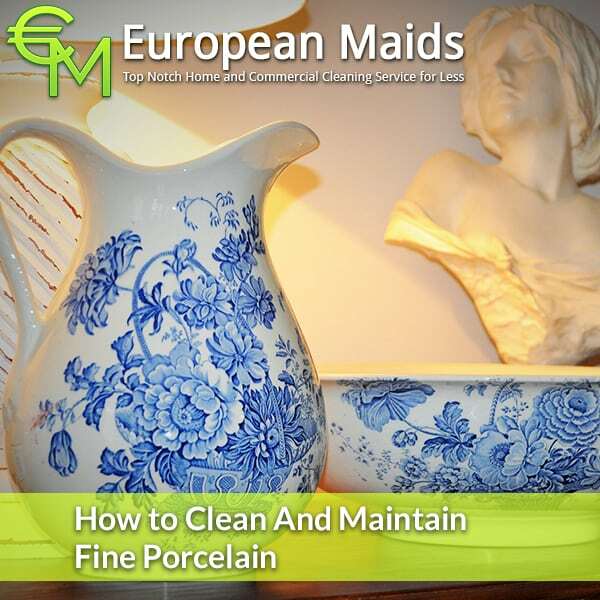 Porcelain is a fragile material, so when you clean it, you should be extremely careful. 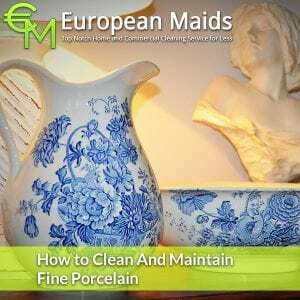 Fine porcelain products are usually one of the most expensive things in the house, therefore, in order to preserve your precious collection of dishes, you will certainly benefit from the advice collected in this article. Porcelain and other types of Chinese ceramics are often used to decorate the house – whether it’s floor vases or tiny figures. However, these decorative objects easily accumulate dust and dirt, so it is very important to look after them properly. First, remove the dust with a dry cloth, preferably from a microfiber, which will collect the dust, and not transfer it to another place. Then, with a small brush with a soft bristle, remove the dust from the tiny slits. Wash porcelain products in warm (and not hot) water with a mild detergent, preferably in a plastic basin, so as not to damage the product about the ceramic sink. Rinse the products under warm water and put on a towel to dry. When cleaning fine porcelain, the most important thing is to avoid sudden changes in temperature. Do not wash it in too hot water and lower the thin objects (plates) into the water slowly and gradually, so that the product is accustomed to the temperature. By the way, with a sharp contact with heat, the metal finish of the dishes can be damaged. Wash the porcelain products with your hands, not in the dishwasher, where it is easy to damage them. Avoid chlorine-containing and other strong cleaning agents. Spots on porcelain can be cleaned with a sponge with soda or toothpaste, but do not use a toothbrush and other bristles with stiff bristles that can scratch porcelain. First, test the agent on a small area of ​​the surface. If the stains are not cleaned out – mix in equal parts salt and vinegar and leave on the stain for an hour, and then rinse in warm water. Again, do not forget to first test this method of cleaning on a small area of ​​the surface. To remove the stubborn stains, leave this mixture for longer or clean products with a special cleaner for washing porcelain with the addition of hydrogen peroxide. Be especially careful when using such potent agents and first test their effect on a small and subtle area of ​​the surface. In some bathrooms there are porcelain elements, for example, taps, shower heads and tiles. Wash them with a weak solution of dishwashing detergent and warm water in the same way as utensils or porcelain ornaments. Do not clean porcelain in the bathroom with coarse abrasives and washcloths. 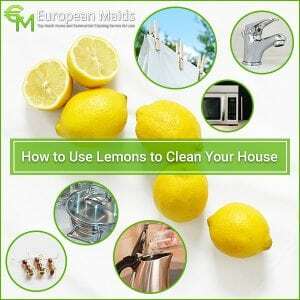 Try clearing the lime and water spray with a paste of soda and water or a special cleaner for cleaning porcelain in the bathroom. Getting a room in perfect condition is one of the hectic tasks faced by vacation rental owners. They have to make sure that bathrooms are squeaky clean and there are no dust bunnies roaming under the bed. Usually, guests judge a hotel service on the basis of how clean their rooms are. You don’t want to receive a bad review just because you missed a spot on the countertop. Unlike home cleaning, you have to complete your tidying-up procedure before the guest arrive which might become mission impossible during the busy time of the year. You might have a few hours to complete this time-consuming procedure. Moreover, you don’t want to wipe the same piece of furniture several times in a day or weeks. This is where vacation rental cleaning service comes in. House cleaning does not require much effort as you know every nook and cranny of your house and the people residing with you. In the hotel business, you come in contact with various people. You don’t what type of individuals are staying in your rooms and how much mess they will leave behind. To avoid complaints from next guest, hire vacation rental cleaning service so they can make the rooms look like they never been used before. Furthermore, they will disinfect the room especially bathrooms, kitchens, and floors. Your guests won’t cause a ruckus that they got infected by bacteria while taking bath in the tub. Human error is unavoidable but for your guests, it is unpardonable sin. They will not forgive you if they notice a spider web on the ceiling. A human eye might overlook such small details and these mistakes are acceptable during house cleaning. One of the benefits of a vacation rental cleaning service is that they will take care of every dust particle. They will thoroughly wipe the windows and window sills. They will get rid of all the swatted bugs present on your walls. They will also stock on supplies such as towels, paper towels, soaps, etc and will replace burned out light bulbs. In other words, you can introduce the room to your guests without worrying about dirty door knobs. During the busy season, you won’t have enough to properly clean a room. As a result, you might have to handle several unsatisfied guests. Vacation rental cleaning service will tidy up your rooms in no time as they have more members on their team and they are professional at finding dust. Some services have more than twenty years of experience in this field so you can blindly trust them in providing quality maintenance. Home cleaning is at a different level from cleaning a vacation rental. You need to ensure that your customers are satisfied with their room and they don’t get infected by any disease. Keep in mind several points before hiring a vacation rental cleaning company. • You should specify your expectations to the vacation rental cleaning service you hire. To make it easy for the company, provide them with a checklist. • Make sure that you book them in advance. Last minute hiring might not provide the results you hope for. • Find out how much experience they had in this field. Also, ask the company to send their old employees instead of amateurs. • Try to be understanding and polite. If you become rude the cleaning service might not give their best. As result, the reputation of your business will be ruined. Bad reviews might have a bad effect on your business. The vacation rental cleaning service main purpose is to ensure that your customers give you good reviews on the internet.